Bodum wouldn't dare call their upcoming Bistro line of appliances "rugged," but wrapped in rubber and dotted with grippy nubs, they feel like power tools re-imagined by a toy company. And I mean that in the best possible way. 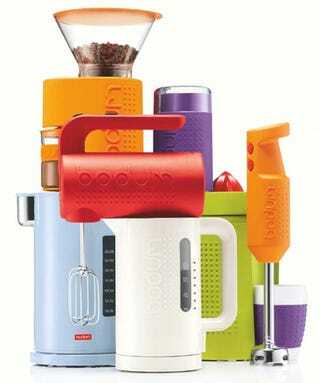 Fondling Bodum's latest product line at the International Home+Housewares Show, I become enamored not just with the array of colors, but the hand feel of their kitchen appliances: Spongy but durable, cutesy but designed for people to actually use. Clockwise from the top: BISTRO Electric Burr Grinder, BISTRO Blade Grinder, BISTRO Electric Juicer, BISTRO Handheld Blender, BISTRO Electric Water Kettle, BISTRO Hand Mixer and ETTORE Electric Water Kettle.